Sunset Bamboo™ is pleased to bring you the original Palm Island Thatch™. Made from carefully hand selected commercial grade palm leaves, our thatch roll, thatch panels and thatch umbrella covers stand out for their ability to withstand rain, wind, and defend your roof against the fierce elements of nature by defecting harsh sunlight. Purchasing thatch from Sunset Bamboo assures that you are getting the only commercial graded thatch in the U.S.
Palm thatch and tiki thatch are constructed by taking natural palm leaves that have been matured and tested for strength, durability and longevity and making them into strips then curing them. The final product is then produced into what we call "thatch" to make a number of different thatch products. 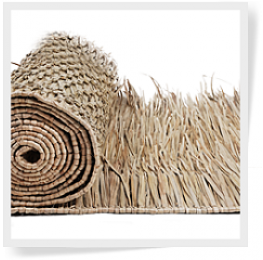 We offer treated tiki thatch rolls with class A fire retardant for customers that are installing at a business location or that live in a HOA community whether using the thatch rolls inside or outside that will require a fire marshal inspections. Fire retardant is also great for customers that have a palapa structure that is close to a house, BBQ grill underneath their structure, wood burning fire pit or forth of July type holidays. This will definitely give you a piece of mind during the hot summer months. We also offer a thatch sealer that can add up to 2 years of life expectancy when installing tiki thatch on a open air roof. We will add these products to the material prior to shipping to you, please choose one or the other fire retardant or thatch sealer on the drop down menu if you would like your thatch rolls treated, you can not combine the two chemicals together. This process takes about 3-4 additional business days to ship, keep this in mind when ordering. Please note that each roll requires a minimum 12" overlap per row and make sure to add material for overhang around the edges. Palm Thatch AKA Tiki Thatch Rolls, Thatch Runners, or Thatch Ridge Cap Rolls is made with 100% renewable dried palm leaves that leave the tree unharmed in the process. It is one of the most traditional thatches used in many different cultures. This material is perfect for many roofing projects including tiki hut roofs and tiki bar roofs. The material is popular because the multiple layers of palm leaves increases its effectiveness in locking out rain, moisture, and dirt. If cared for, palm thatch can last up to 5 years. Palm thatch is one of the oldest and most reliable and durable products. The creation and use of palm thatching is a very old tradition that has been passed on from several generations. The kind of grass matters when it comes to thatching; finer dry grasses are more suitable than thicker stemmed grasses. It is a very popular style for roofing used by commercial builders in tropical locations, as it is very easy to handle and install. Our palm thatch products allow you to have a smart alternative, which is equal to, or better than modern standard roofing materials. It provides warmth in the winter seasons and can withstand harsh weather conditions such as extreme rainfall, heat and wind. It is also used as a natural alternative for insulation. Another great thing about palm thatching is that it is made using eco-friendly practices. Harvesting palm thatch instead of wood products will help to preserve our forests and minimize pollution. This particular product is extremely reliable (if maintained properly), practical, and attractive and will revamp any outdoor space. If you are looking for an eco-friendly, and effective roofing DIY project, then palm thatch is right for you. 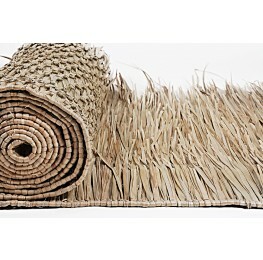 Our palm thatch already comes assembled and hand-woven to make installation quick and easy. Not only are our products durable, we offer always free shipping combined with great customer service.